Time restricted feeding (TRF) is a form of intermittent fasting (IF) or fasting mimicking diet (FMD); meaning there is a time period of eating and not eating (fasting). This is supposed to help your body become more efficient by working with natural circadian rhythms, instead of fighting against that natural clock. This means that instead of trying to eat on an unnatural 24 hour clock, eating is limited to a day/night schedule of > 12 hour fast. *Studies show promising results for types of intermittent fasting, however, results are not conclusive. Actually, many do not show increased benefit over simply restricting caloric intake. However, most find it easier to restrict time than calories and adherence is likely much better on intermittent fasting (leading to better long-term results) than diets that restrict what you can consume. TRF works on the premise that calories do not need to be restricted because the period of prolonged not eating is where the benefits really stem from. So although you may naturally decrease calories, TRF does not require that. Simply, you pick 8 to 12 hours to consume calories and 12 to 16 hours to fast. What constitutes a fast? During these 12+ hours of not eating, you may drink water, lemon water, ACV, herbal teas and black coffee. Nothing else. Not even gum. Definitely not sugar free food or drink items like jello or diet soda. This will mess with how your body senses hunger, satiety, and taste. While the concept is simple, there are some details to consider. Products like BulletProof coffee (adding pure fat – typically grass fed butter or coconut oil - to black coffee) claim to be fasting safe. I’ve come across very limited (n=1 accounts) studies that suggest that adding cream, butter, or oil to coffee does not raise glucose levels out of fasting range. Drinking these can promote satiety during your fast… but part of TRF is to get the body used to not digesting, not feeling full… so I’d really skip this. Many popular plans work on a noon-8pm window. I think this timing doesn’t work for most of us. The point of TRF is to enhance your natural energy fluctuations. For the majority, energy levels are highest and productivity is therefore highest in the morning – late morning hours. For this reason, it makes more sense to start your eating window earlier in the day, say 10 am, and end earlier in the evening, say 6pm. Another key reason to end the eating window earlier is that it forces you to be mindful of your evening meal, requiring some planning and preparing that meal in advance. Beyond that, calories consumed late in the evening typically end up fueling your sleep (not needed) and tend to be poorer quality than calories consumed earlier in the day. To get started, figure out your current eating window. 12 hours might seem long, but chances are you currently function on a 14-16 hour schedule. For example, if you grab a latte at 6am and snack on popcorn during an evening movie until 9pm, you’ve been consuming calories for 15 hours. Once you know this information, start by restricting to 12 hours. You might want to spend a week at 12 hours to adjust to the TRF. Then, begin working your way down to 8 hour eating windows. It is fine to be flexible, 8 hours one day, 10 the next… as long as the time between eating windows is at least 12 hours. One of the biggest topics I want to address is how to incorporate this as an athlete, because well, fueling performances (or not fueling them?) is my expertise. Athletes completing hours of training a day and multiple training sessions a day will need to be the most attentive to their nutrition needs, but are not excluded from following TRF. The biggest concerns for these athletes is to make sure they are able to obtain enough calories, carbohydrate and protein to support the training load each day during the eating window (remember the goal of TRF is not to cut calories). This can be tricky as consuming 3,000 (+/-) calories within 8 hours might feel like a chore. Adding extra liquid calories, bars, and calorically dense foods will help. Attention must also be paid to making sure key workouts have fuel coming before to support the effort. Recovery (eating immediately after training) is also a need to account for. While this may sound like a lot to take on, it can be very beneficial for an athlete to focus on and be mindful of nutrition. There are also potential performance gains to fasting such as increased fat utilization, increased endurance and better aerobic capacity. So how does an athlete properly implement time restricted eating? First remember that not every workout needs to fueled. Recovery and short duration sessions can be performance without fueling. Key sessions that include high intensity, performance targets or are over 90 minutes; however, do require food for best results. If there is no key training session coming within 24 hours of the first, immediate recovery fuel is not needed. As long as the athlete eats a balanced and adequate intake between sessions, full recovery will be reached by the next session. Fasted workouts should include proper hydration (minerals are okay, but no caloric drinks), be short in duration, be low intensity. Athlete R has a 3-hour bike ride starting at 8am. This athlete can start fueling at 9am while on the bike (allowing for an hour of fasted workout to promote fat utilization) and stop fueling at 5pm; an 8 hour window. Athlete P has a 45 minute run at 6am and a 30 minute HIIT weight session at lunch. This athlete can complete the run fasting, but needs to consume recovery nutrition immediately after the workout. Meaning their window could be 7am to 4pm. Athlete W has a 2-hour race pace brick workout starting at 9am. They also have a 1-hour recovery spin at 4pm. To ensure there is energy to replicate race performance, the athlete should eat prior to the workout and multi day sessions need to be well fueled afterwards for proper recovery. This athlete’s window could be set at 6:30am – 6:30pm; a 12 hour window. Athlete W has a 7am yoga practice and 6pm 20 minute jog. This athlete does not need special performance nutrition as could have a window of 9am to 5pm; 8 hours. Athlete B has a 2 hour interval ride at 5:30pm and 8am the following morning. This athlete should place more fuel later in the day to ensure enough energy for the first session and rapid recovery for the second session. Their eating window should be 11am – 9pm; a 10 hour window and the second day eating should resume at 9am. Sometimes, you may need to structure your workouts in a way that fits your window for best health and performance gains. An example would be doing weights in the evening and endurance in the morning or high intensity at lunch and recovery in the morning. It is best to work with a professional (contact for services) to develop a structure that ensures your specific performance fueling needs are being met on a TRF schedule. I’ve been time restricting my diet for over 4 weeks now. Mostly I adhere to a 9 hour schedule, but that has fluctuated from 8 – 12 hours depending on specific needs (both social or athletic). During this 4 and a half week span, I’ve taken 2 days off, meaning my fasting period was shorter than 12 hours. Not bad as far as sticking to a diet goes. Honestly I’ve found it pretty easy to adhere too, even while on a training camp week with a high volume of cycling. There are mornings I wake up feeling hungry and some I don’t. There are evenings I long for a bite of food after dinner and others I feel content. However, these feelings aren’t extreme and easy to ward off with some black coffee or hot tea. I find this much easier to have the black and white cut off of ‘no food after Xpm’ than ‘no sugar/ no carbs/ no animal products….’; time is a definitive where what to eat is a grey area that leads to further temptation. 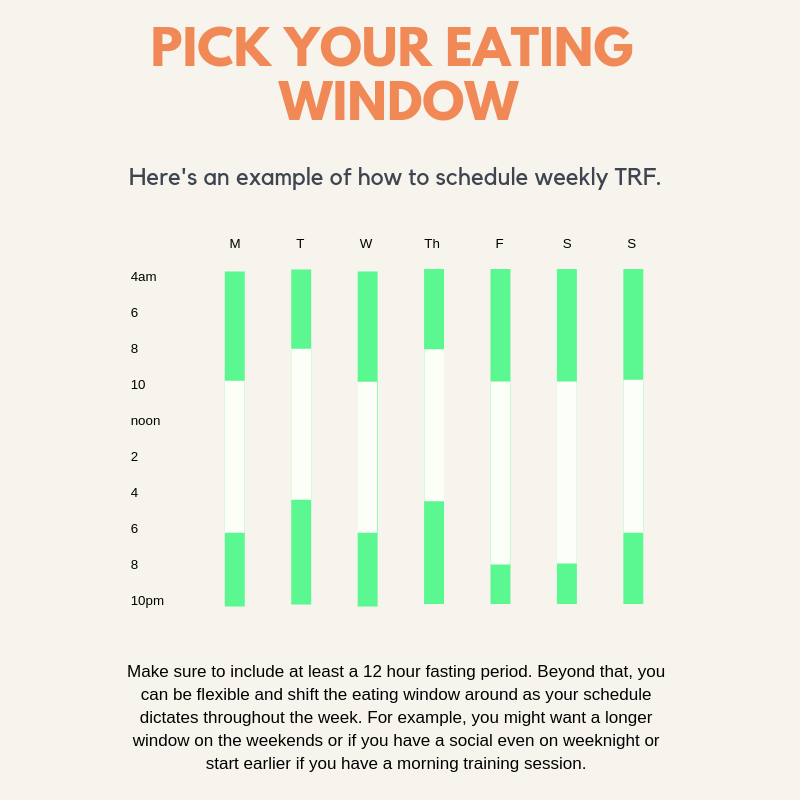 During shorter windows, I often feel full and consume a lunch that is smaller than normal or relying on a shake or bar, an example of how TRF naturally reduces portion sizes. My eating window tends to be 9am -6pm or 10am -7pm most days. This allows me to fuel the hours I am most active, eat dinner with my fiancé (most of the time) and restrict the time of day my diet is at it’s worst; the evening. That single fact has been the most helpful part of this for me. I often fall into the trap of mindlessly munching while stretching or watching a movie before bed. If I were eating raw carrots that might be okay, but let’s be real, I’m pouring another glass of wine, reaching for the ice cream or the chocolate… things that will most definitely not help my performance or weight. Have I seen any crazy results? I haven’t lost weight. I do feel energized and mentally focused. I do feel good about what I’m eating. I am motivated to continue this and see how I react once I restart my training again. My fiancé has also been doing this. Supposedly men react better to fasting than women, but in this case we are on the same page. He hasn’t seen a body composition change, but agrees that it promotes better habits. These are some of the top questions I’ve received from you guys since posting about this topic. What’s the minimum time to fast? 12 hours. What if I have a morning workout? See the athlete examples above. Many workouts can be done fasting, others will need fueling. What if train twice a day? See the athlete examples above. Depending on your exact training, you can still do TRF. For extreme training schedules, you might need to take the day ‘off’ and pick up the next day. How long do you have to do this? Results are not immediate, like any lifestyle change, you need time to see results. 3 months of practicing TRF will likely be enough time to see change if you’re going to. Will this mess up my hormones? NO! Hormones get messed up when athletes have a prolonged depletion of energy availability; meaning for a long stretch, you’ve been skimping on calories and carbs needed to fuel performance and health. TRF does not restrict these things, it restricts time. 12 – 16 hours is not enough time of a fast to do any damage to your body as long as you’re eating a high quality diet that meats your needs during the eating window. What if you mess up and eat during your fast? Like any ‘diet’ mishap, you brush it off and get back on track. I strongly believe that this eating style can work for most people with a little effort and schedule adjusting. However, no one style of eating can work for EVERYONE. If you take medications that are time sensitive and need to be consumed with food, you might not be able to partake in TRF. Those who follow non traditional schedules such as working night shifts may not be suitable candidates for this eating style. Also, if you’re an elite athlete on a high-volume training plan with multiple sessions a day, you might put your season at risk by adhering to a tight eating window. I do believe it is possible on a 12 hour window, but will take extra effort to ensure your timing is aligned with performance needs and overall calories are sufficient to promote daily training gains and energy needs. If you are looking to take on this style of eating and would like extra assistance, contact me!